The original Jurassic Park was a trailblazer in visual and special effects, so it is fitting that the film receive an update in the latest in home entertainment technology. Although more impressive for the animatronic effects than the computer generated ones, the sharper image and dynamic range of colors still enhance the twenty-five-year-old film. And even without these enhancements, Steven Spielberg’s first dinosaur film is still a classic worth revisiting. The first movie introduces the idea of a theme park featuring cloned dinosaurs, brain child of radical scientist Hammond (Richard Attenborough). When a group of experts are brought in for a preview weekend, they are given a far closer look than expected when the creatures escape from their exhibits and run free in the park. This simple concept is also what revived the franchise with Jurassic World, although with the inclusion of crowds to complicate things further. Steven Spielberg returned to direct the sequel, The Lost World: Jurassic Park, which is somewhat mis-titled and not the most memorable in his filmography. Not only is there no amusement park in this film, there isn’t really a lost world either. All that the film has is a second island where the research and development for the amusement park was carried out. The island isn’t lost and it isn’t an amusement park, but there are still plenty of attacking dinosaurs, which is always the primary reason for these films. It turns out that there are several different groups on the island, each with their own reason for being there, adding more nefarious humans to the list of monsters in the movie. This one may have a bit too much backstory, taking too long before the dinosaurs really start to attack. The Lost World brought back Ian Malcolm (Jeff Goldblum) from the first film, and Jurassic World III brought back Dr. Alan Grant (Sam Neill). Once again, the film takes place on a separate island from the original Jurassic Park, but Dr. Grant does not return willingly. Grant is kidnapped because of his experience with the dinosaurs, by two parents (William H. Macy, Téa Leoni) desperate to find their lost son. This rescue mission results in the usual terrifying adventure involving velociraptors and other dinosaurs. There are a few new dinosaurs introduced, but still manages to be the shortest movie in the franchise. There is less plot, but also a lot less filler to slow things down. Jurassic World is less of a sequel and more of a revival, returning to the original island and concept without any of the characters from the first three films. The theme park imagined in the first film is finally up and running, with little concern for the tragedies of the past. And as if the dangers weren’t enough, the new owners of the theme park decide to genetically create an all-new dinosaur that is more intelligent and deadly than all the rest. The screenplay also finds a way to fit children into the plot, as all of the films previously had. Replacing Goldblum and Neill is Chris Pratt as a velociraptor trainer and Bryce Dallas Howard as head of the park. So here we are, ready for the latest installment of the franchise, which will all but guarantee another box set release like this in the future. Until then, however, this 25th Anniversary release is the best option for fans of these films. Although the special features are all just taken from previous releases, this set puts them all in one release for the first time. Each of the films comes on a 4K disc, but all four also have Blu-ray copies. It is on the Blu-ray discs that the special features are also included. 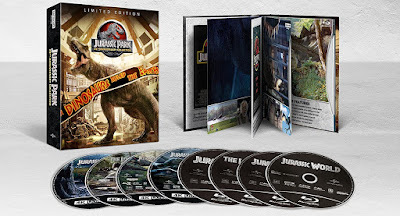 There is a making-of documentary for each of the first three films, as well as a six-part retrospective documentary, deleted footage, and numerous other little promotional featurettes for all of the films. There are also digital copies included for each of the four movies.